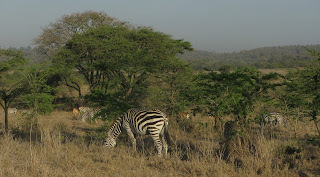 Nairobi National Park: Never Too Many Pictures of Zebras! Zebras are still my favorite animals. I can look at them for a very long time. And I can take another hundred pictures of them and never get tired. We found a large watering place where hundreds of zebras, wildebeests, impalas, hartebeests, and buffalo were coming to water. Fascinating to watch them coming and going and basking in the cool water. There's an especially intriguing video of a zebra rolling on to its back. Who would guess there's a stripe down its belly? Sorry for the blurry videos at times. I thought I was moving slowly but I guess I wasn't. Also, some of the videos were too large so LeRon had to make them smaller which decreased the quality. Oh well. Still love those zebras!